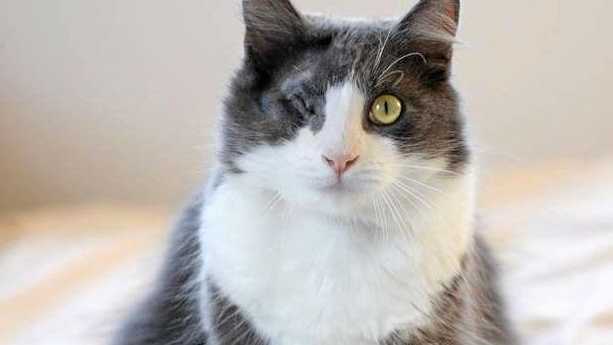 MARCELLO, the cat who was hurled over a fence in a distressing video that went viral in April, is all healed up and ready for a loving forever home. RSPCA shared a photo of the moggy, now up for adoption, who was the subject of a horrific video showing a former Mackay man and his friends laughing as the cat smashes into the exterior brick wall of the neighbouring house. "With the help of the public the offender was identified and has now been prosecuted," the RSPCA said. While in care, Marcello visited the vet 27 times over two months, and he was treated for three bouts of stress-induced cat flu. The third relapse included a consequent severe eye infection. After initial treatment efforts were unsuccessful, surgery was required to remove his infected eye. Now, the RSPCA says, Marcello is ready to move on with his life. "He's only just over one year old and he's looking for a quieter home where he can build his trust in the world again. With a little reassurance and time his bright and happy personality will shine through," his social media adoption ad reads. "Marcello is in foster care near RSPCA Brisbane, Wacol. Email adoptfromfoster@rspcaqld.org.au to meet him." Sickening footage emerged in April of a man dressed in high-vis tradesmen gear picking up a black cat and throwing it over a fence in Ipswich. The man and his two friends can be seen covering their mouths to stifle their laughter. Samual Conroy, 19, pleaded guilty in Ipswich Magistrates Court in May to animal cruelty, and publicly apologised for his behaviour. The 19-year-old former Mackay man told the Daily Mercury in April he was "incredibly sorry" and "extremely regretful" about what he'd done. "There's no going away from it, I am the one that did it in the video," he said. "There's nothing to lie about and nothing to hide, it's just a stupid act I did." Conroy was ordered to pay $1100, banned from owning a pet for five years, and sentenced to 12 months' probation and 120 hours community service. Score a Samsung Galaxy tablet when you sign up for a 12-month Daily Mercury digital subscription. Head to www.dailymercury.com.au/tablet　or phone 1300 361 604. Hurry, limited offer.